The one common denominator with all champions is that they are practicing all year-long, even when their sport is out of season. This is especially true of the wrestler, who is always working to hone his skills and get better each performance. One of the ways these wrestlers are improving their skills at home is by protecting themselves and others by purchasing high-quality wrestling mats to work on. These mats come in many sizes, and will easily fit in a small room, basement, garage, or even the backyard. These mats are the same grade but on a smaller scale to the ones used by wrestling teams in college and high school wrestling tournaments around the country, similar to the best cheerleading mats. The following four wrestling mat reviews will give you a good understanding of what to look for in a new mat and what differentiates one from another. Looking to get in some practice at home without needing to take up the entire living room to do so? The Dollamur Flexi-Roll 5’x10’x1.25″ wrestling mat is the perfect portable and smaller size mat that has a competition grade surface that can withstand constant and repeated compression. These mats are manufactured utilizing athletic grade cross-linked foam and closed cells that provide for maximum shock absorption. The high-grade vinyl surface will not crack even under the most extreme abuse. Therefore, it will never need to be reconditioned. The cloth backing lets the vinyl be heat laminated so it bonds directly to a closed cell foam. This high-quality mat gives the wrestler the ability to improve their speed and resiliency in a very demanding sport. The surface of this wrestling mat has been carefully treated with antimicrobials that will guard against microbial deterioration and odor-causing microorganisms. This is a smaller size version of the Dollamur’s competition wrestling mats used in prestigious events worldwide. Don’t let the small size of this wrestling mat fool you, AK Athletics is a name you can trust when it comes to high-quality, durability, and high-performance. This wrestling mat for home use resists rot, mildew, and is made without phthalates or lead. The materials are both anti-fungal and antimicrobial, and can easily be rolled up to store out of the way when they are not being used. These shock absorbent wrestling mats are 1 3/8″ thick and make use of cross-linked foam. The mat tape is included for free with the price of your mat and will give you plenty of years of use even with the most active and dedicated wrestling enthusiasts. These exact same mats have been purchased for schools, government training facilities, and even the military. These 8′ x 8′ mats are constructed of 22 ounces heavy-duty vinyl and come in two 8′ x 4′ sections that need to be taped together. 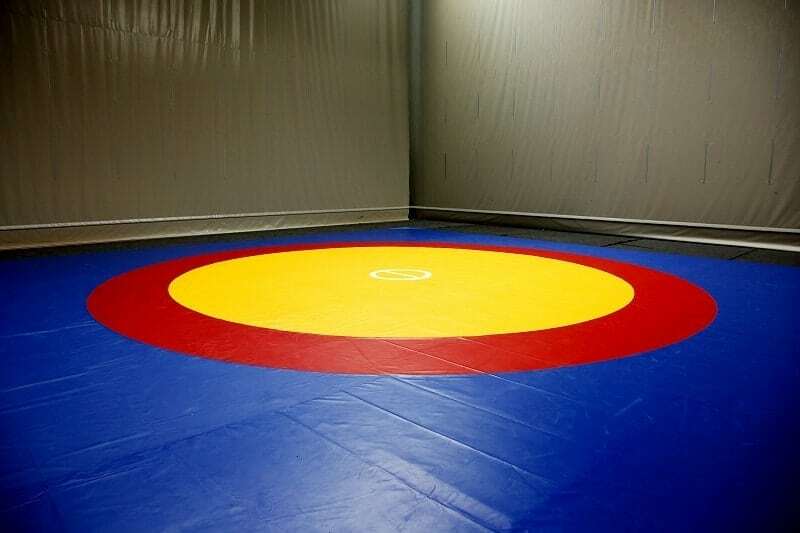 Although the AK Athletics wrestling mat with starting lines and red and white circles is classified as for home use, be sure you have plenty of space because when assembled will measure 8′ x 8′. These high-endurance wrestling mats are made to be mildew resistant and UV resistant. The surface of the mats is antimicrobial and anti-fungal, utilizing shock absorbent 1 3/8″ polyethylene foam. These home mats can easily be rolled up for storage. These mats are designed to withstand the strong abuse that comes with the territory of wrestling. These are the exact same mats that you will see at college and high school wrestling competitions. Each wrestling mat when taped is 8′ x 8′ x 1 3/8″ thick. 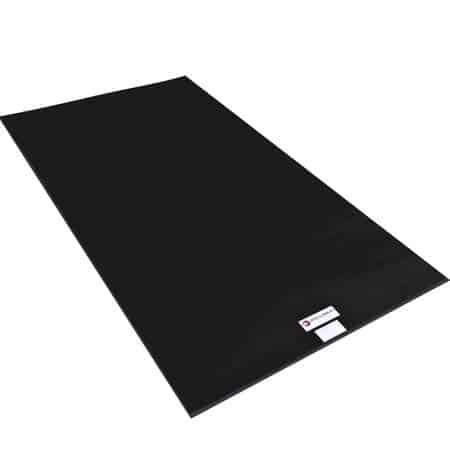 The mats are 22-ounce heavy-duty vinyl and make use of high-endurance shock absorbent foam. When you order this made, understand it comes in two sections of 8′ x 4′ and needs to be taped with the free mat tape included in the package. Every mat comes with white starting lines and circles that give the wrestler the ability to perform like they were actually participating in a competition. When it comes to the king of performance mats, your money will be well spent on the high-quality AK Athletics roll-up 10′ x 10′ black wrestling mat. These mats are engineered to withstand significant abuse while giving the athletes a competitive edge to be able to spring into action when needed. These mats are made to last, they are made from shock-absorbent materials and resists UV rays, rot, and mildew. Each mat is antimicrobial, anti-fungal, and comprised of 1 3/8″ polyethylene foam. The mats look sturdy, but they are easily rolled up for home, business, or even school use. The mats come in two different sections, and the mat tape is included for free to easily join the two 10′ x 5′ sections together. Once attached, the large 10′ x 10′ wrestling mat is ready for action. These mats have been carefully constructed with the serious wrestling enthusiast in mind. Manufactured in the U.S.A, they are built from high-grade materials and designed to give you many years of use without chipping, ripping, or tearing. Now that you have a better understanding of what goes into manufacturing a durable wrestling mat, all you need to do now is decide which size will fit best in your home. The materials are thick enough and strong enough to be set up outside on a flat surface and will not rip or tear from abuse. These wrestling mats are the same as you will see in many government training facilities around the country, just in a smaller version, similar to durable tumbling mats. Buy in confidence that you are getting something that will allow the wrestler to craft their skills and gain that competitive edge they need to succeed in this very competitive sport. Photo from: sociopat_mpat / depositphotos.com.